For years, Rock Band was my go-to party game. But with the advent of a new generation of consoles, those plastic instruments have been left to gather dust. Rock Band 4 reintroduces the classic recipe for a new generation, but that classic is missing a little of the spice I remember. At its core, Rock Band 4 is still the same: one player on drums, two on guitars, and up to three on vocals. If you liked the original, the good news is that Rock Band 4 is more of that. Rock Band remains a blast when played with a full band made up of friends and family. The bad news is that very little has changed in the jump between console generations. In fact, the most glaring problems are what was stripped out of the game between Rock Band 3 and 4. As a long time fan of the series, it’s hard not to be disappointed when basic features of the previous games don’t make an appearance. Some of the scuttled facets of the Rock Band experience include practice mode, online multiplayer, pro-difficulty guitar tracks, and most distressingly, the keyboard. The keyboard was my favorite instrument in Rock Band 3, and here it’s been dumped in order to focus on the core four instruments. Even the character customization options are a shell of what they once were, with far fewer clothes and hair options for your created characters, and no options to design tattoos or a logo for your band whatsoever. Still, I take heart in these absences, as developer Harmonix seems to be setting Rock Band 4 up as a new platform that they’ll add features to over time. I would be wary of this promise, since they had similar plans for last year’s Dance Central Spotlight, which were seemingly abandoned after a few months. However, Harmonix has already started to make good on this, as they’ve already patched in a few missing features, such as the option to have created characters stand in for absent band mates. Another major update is planned for December. The major new feature is the freestyle guitar solo. While players were previously forced to press a precise series of buttons during guitar solos, here players are offered the option to just press whatever buttons they like to make a custom solo. You don’t need to actually know how to play guitar, the game will fudge your fretting into something resembling actual music. While it takes some getting used to, the feeling of creating your own solo really is electric; more than ever before this makes you feel like a rock star while requiring a fraction of the talent. Thankfully, purists can turn this feature off if they’d prefer to play the original solos unchanged. Other additions include freestyle vocals, which allow singers to get credit for harmonizing with the lead vocal track rather than matching it perfectly. It’s a cool bonus, but feels in practice like the game is rewarding you for singing “close enough.” Also new is the drum fills, which really are kind of the opposite of the new guitar solos. While previous Rock Bands would allow drummers to play any sequence of drum hits during specific drum fill sections, Rock Band 4 gives some suggested sequences of notes, in case the rhythm-illiterate need a little help keeping the beat. Maybe the most remarkable feature of Rock Band 4 is that it supports a massive library of songs downloaded from previous Rock Band titles. Harmonix undertook the impressive task of adapting over 1,700 songs to be used on the new generation of consoles. Provided that you’ve stayed in the same console family between generations (like jumping from Xbox 360 to Xbox One or from PS3 to PS4), nearly all your old songs will transfer to Rock Band 4. Ultimately, how much enjoyment you’ll get out of Rock Band 4 is most likely proportionate to how much time and energy you’ve invested into it in the past. If you’ve played the last three versions of the game and already have a sizable library of downloadable songs built up, you’ll have a large song list from the get-go. 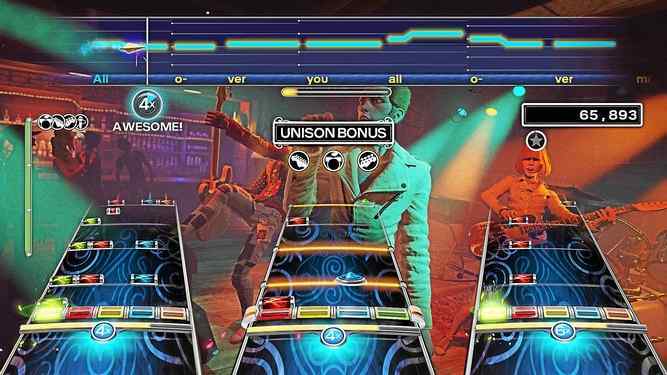 On disc songs from previous editions of Rock Band will soon be usable as well, according to Harmonix, with each game adding between 40 to 70 more songs to the list. And if you have wireless instruments from the previous versions, those can be transferred over as well. There are caveats to that, of course. Certain songs that have been removed from the store due to licensing issues are no longer available. Those wireless instruments, at least on the Xbox One version, require a special adapter to work on the new console. Old wired instruments don’t work at all with Rock Band 4. I bought the $250 “Band-in-a-Box” bundle of the Xbox One version for the purposes of this review, which came with the game, a guitar, a drum set, and a microphone. Also available are a game and guitar bundle for $130, the standalone game for $60, and for Xbox One players only, the game with the wireless instrument adapter for $80. While it doesn’t supplant Rock Band 3 as the definitive living room band experience, it seems promising that Harmonix is continuing to support content that’s close to a decade old and there’s more to come. With Rock Band 4, the time seems right to get the band back together.